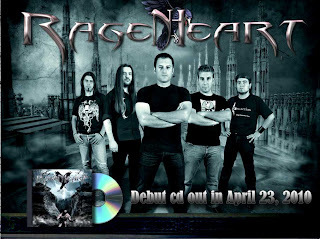 Ragenheart's self titled debut is coming out on April 23, 2010 ! "..and the most recent addition to our roster, Greek RAGENHEART won us over with their superbly played melodic heavy/power metal with some prog metal elements, rooted in hard rock. They had released only 1 demo (in 2006), which garnered enthusiastic reviews from all over the world. Since then they've become a much tighter band and perfected their sound, so the debut album "Ragenheart" offers versatile and passionate music with a usually dark and epic mood, remarkable melodies, fantastic singer with great emotion and range and excellent performance by every musician, topped with clean and solid production. Their music should appeal to fans of CONCEPTION, RAINBOW, MAGNITUDE 9, DIO, EVERGREY, HEIR APPARENT, MYSTIC FORCE, CRIMSON GLORY, WHITESNAKE..."